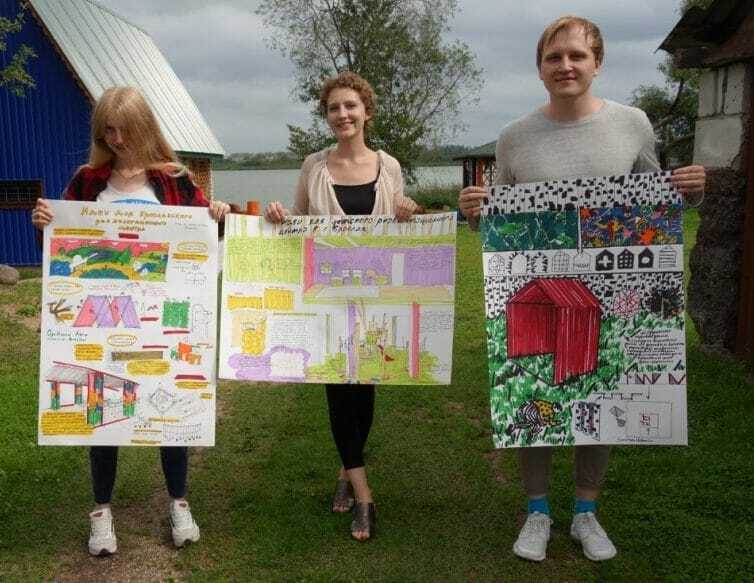 humanitary co-operation project "on the move"
Horizon and motivation: Since 20 years the German-Belorussian organization KAJA has invited art-, architecture- and design students from many eastern and Western European countries to come together for summer-camps in the Belorussian National Park "Braslaw Lake District". In the last years the focus of creative workshops was put on the development of project proposals for the participation of the youth of Europe in the regional development / youth tourism of the Braslaw district. The meetings were support from the EU program "Youth" / Erasmus + and the German federal state "Northrhine-Westfalia". Actual the local Special Education and Rehabilitation Centre for disabled children and young people in Braslaw proposed KAJA-Org. to invite social engaged and creative students from Poland, Georgia, Ukraine, Germany and Belarus to participate in the further development of the institution and develop new impulses, ideas and designs for some areas of the center. Profile of the rehabilitation center. The so called "Braslaw Center for Correction and Development Education and Rehabilitation" is an institution of special education, which contributes to the provision of an integrated system of psychological, medical and pedagogical assistance to persons with psychophysical development peculiarities living in the region. There, the necessary conditions have been created for the education and upbringing of children and young people with severe and multiple mental and physical disabilities, correctional-pedagogical and early comprehensive assistance to children and young people with special psychophysical development. The project was created taking into account the features of the physical and psychological characteristics of children's development, age and physical parameters (height, weight, etc.) are also taken into account.